A dump and go crockpot recipe that the whole family will love! This Crockpot Ranch Chicken Dinner has the meat, potatoes, and veggies all rolled into one delicious meal. Plus its gluten free & dairy free! I know I am not the only mom who looks for simplicity when it comes to cooking dinner. With back to school time looming I need things that are totally dump and go. We are talking the entire meal…sides and all. This recipe is one of my new favorites! 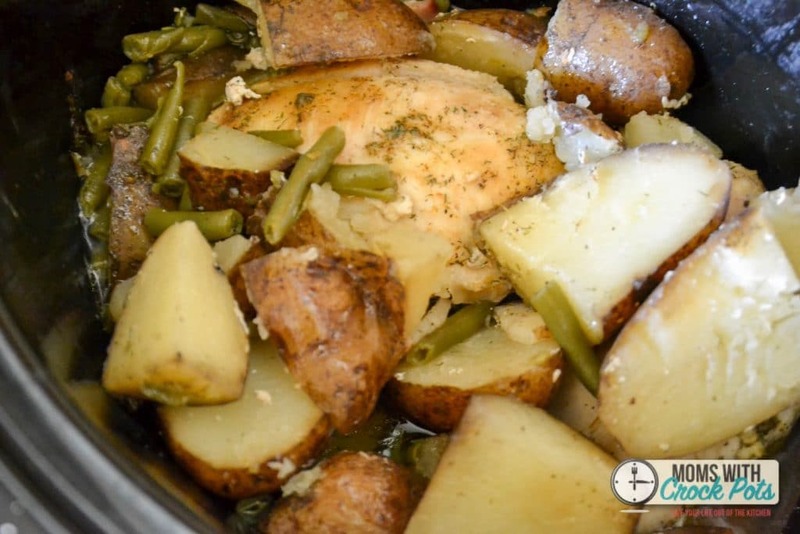 This Crockpot Ranch Chicken Dinner has the chicken, potatoes, and green beans all tossed in together in a medley of delicious bliss. This can be made gluten free, dairy free, paleo (does that include potatoes?) Any way, it’s amazing….I love it…and it is hitting my regular rotation as we head into the busy time of year. PS. The kids cleaned their plates, so it is officially a winner! Into the crockpot went 4 small or 2 large chicken breasts. Mine were HUGE so I only needed 2. Anyway, I quartered some potatoes and tossed them in. I did about 5 russets. Then 2 drained cans of green beans. I topped it off with the equivalent of 1 packet of ranch dressing mix. I actually make my own ranch dressing mix, and it is so good. I also chopped up some bacon and put it on top because you just can’t go wrong with bacon. Cook on high for 4-5 hours or low for 8. My Crockpot is 6 quarts, you can check it out here if you would like to know more about it. This was prettier before I attacked it with a fork to make sure it was done, but it smells amazing! I pulled out the chicken breasts and sliced them into portions. Served with the potatoes, green beans, and a small side salad it was an amazing meal. 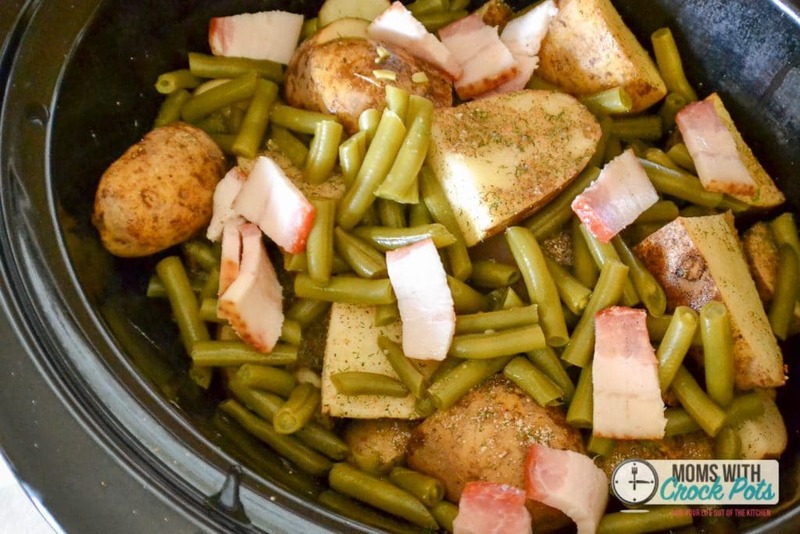 In a large crock pot place chicken, potatoes, and green beans. Top with seasoning and bacon. Cook on high for 4-5 hours or low for 8 hours. 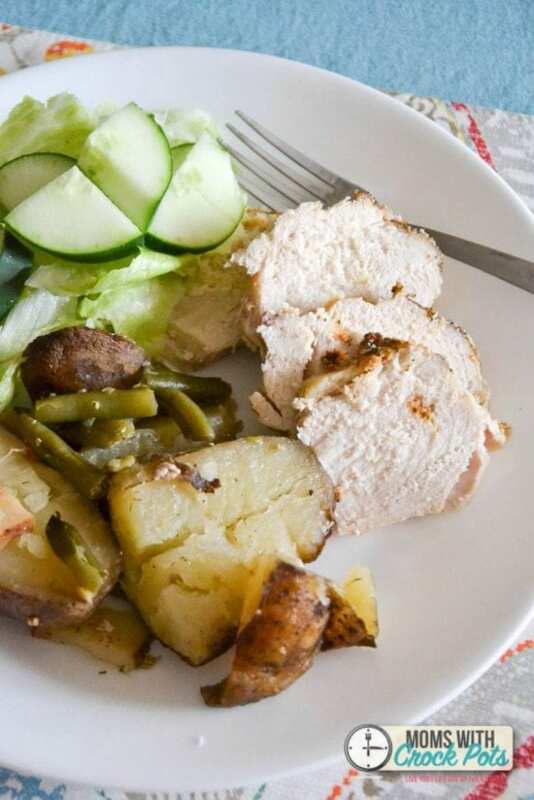 Slice chicken and serve with potatoes, green beans, and a side salad. Do you use frozen chicken breast of thawed? You can use either. However, if you use frozen, you are going to want to increase the cook time by about an hour at least and add a little bit (maybe 1 cup of chicken broth) to the bottom of the crockpot. Of course, you want to check the internal temperature of the chicken before you serve and make sure it reaches at least 165 F. I put frozen chicken in the crockpot all the time and never have an issue. 🙂 Hope that helps. This recipe sounds and looks absolutely delicious. I just have two questions. I always set my crock pot to low. Will the long cooking time cause the canned green beans to turn to mush? Your pictures do not indicate this but I am not sure if you cooked yours on high or low. Could I use fresh green beans? Many thanks. Hi Lawanda, I cooked mine on high and I put the green beans on top. My green beans turned out good, not mushy at all. You could totally use fresh green beans on low and not worry about them at all. As far as the canned green beans, if you were going to cook it on low I would just be sure to put the green beans on the top. They will steam and should turn out just fine. Do i need to add any liquid to this at all? I am new to the whole crockpot cooking. Hi! Would it be ok to double this recipe? It is totally ok to double if it will fit in your crockpot. Mine is 6 – 7 qt and it was full. You mentioned you added some chopped bacon. Did you cook the bacon before or did it cook enough in the crockpot? Thanks! Sounds delicious! I did not cook the bacon first. It cooked in the crockpot and the bacon fat flavored the other items. Enjoy! The recipe looks really good. I have 2 questions. Can I use frozen green beans? Do you cook the bacon before you put it in? I am looking forward to trying this! Thanks! Yes, you can use frozen green beans and I didn’t cook the bacon first. It cooks in the crockpot and the bacon fat flavors the chicken & potatoes. Enjoy! Hi I’m learning about crock pot cooking. With this recipe do you just put the dry ranch on top or do you mix the seasoning per directions? Hi Susan. You are only using the dry powder mix for this. Do you put butter in your recipe? The pic at top looks like it has cubed butter? No liquids chicken doesn’t get too dry? That isn’t butter that is some diced bacon. No liquid is needed the crockpot steams the contents, so nothing turns out dry. It cooks in it’s own liquids. Just don’t lift the lid during cooking. Thank you so much for sharing this recipe. I tried it today and it was DELICIOUS! I used fresh green beans, added carrots and a cut up sweet potato! I will be making this again for my family! Made this recipe and it was a hit with the family. I used 5 boneless skinless FROZEN chicken breasts, 4 thick cut bacon cuped and spread over chicken and also some on top of green beans, two cans green beans, 5 red potatoes quartered and a small chopped red onion, added seasoning packet and additional Trader Joe’s salt-less seasoning cooked on high for 7 hours and it turned out perfect. Also used a crockpot liner.